It the end of the month and today is the final installment of I’ll Review Anything’s Burger Month! 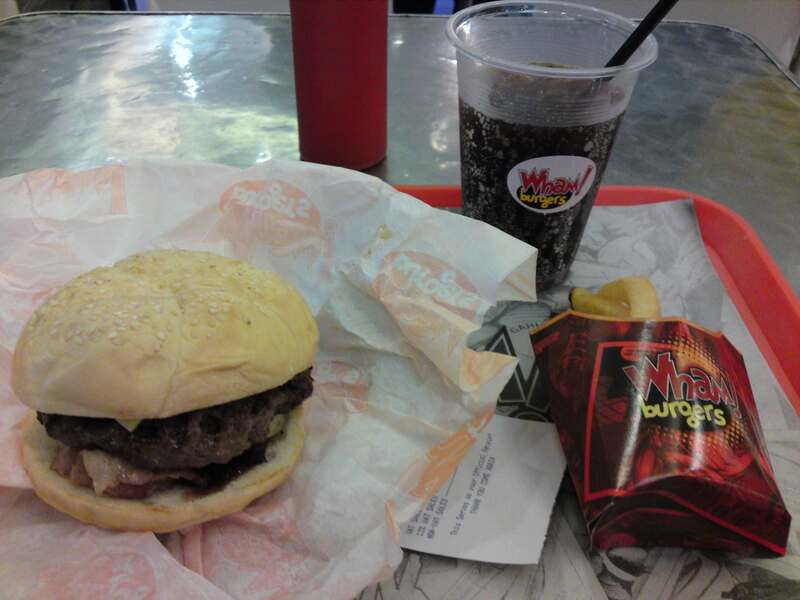 This time, I decided to review a burger joint that I actually like. I was actually introduced to this place by my friend and I remember thanking him for telling me about the place. However, I haven’t been there in a while and, since my last visit, a lot of other hamburger specialty restaurants have popped up. So I decided to go back and see how Wham! Burgers actually stacks up. The entrance of Wham’s Shangri-la branch. Now, I had to, of course, order the appropriate burger. I couldn’t get any burger from the menu; I had to order one that had both bacon and cheese to sort of keep with the theme of the previous reviews and it seemed their Bronco burger fit the bill nicely. I don’t remember if I had this before since, from what I remember, I get the one that has salsa in it. But the meat was cooked to medium done so the meat was still pink but extremely tasty. The Bronco burger contains a 1/3 pound all beef hamburger patty with cheese and bacon (perfect!) but it throws something interesting mixed into it. Instead of topping it off with ketchup of mayo, the Bronco burger uses barbecue sauce. Too bad there’s no set meal with their orders so I had to order additional fries and a drink. As usual, before I partook of the Bronco burger, I opened it up and took a quick gander at its insides to see if everything was in order. That was when I saw something that concerned me: the bacon. The bacon didn’t seem cooked really well. Either that or there was a pretty fatty strip of bacon peeking out from the bottom of the patty. I didn’t really check it out (I usually take the top bun for the inspection and not totally dismantle the sandwich) but I took note of it just in case. 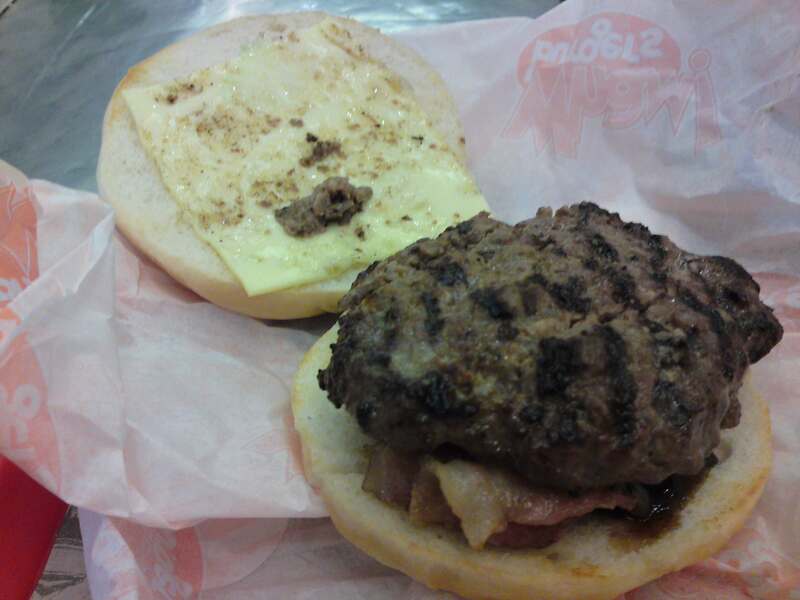 Also, while I wasn’t expecting anything truly special, the Bronco burger looked kind of… well, plain. Okay, I liked that you could actually see the grill marks on the patty. But, other than that, it looked like an ordinary burger with cheese. I guess I was just a bit turned off since there were no contrasting colors. It was just brown inside. Of course, I’ve seen food that doesn’t look good but tastes amazing before and I still had high hopes for the Bronco burger. So I put it back together and took my first bite. I was expecting my memories of the succulent taste to come rushing back to me once I started digging in… but it didn’t. Something was wrong and I realized what it was. The hamburger meat was more than medium done. While it was still okay, it fails in comparison to how I remembered it. Not only that, I was also correct about the bacon strips. They were undercooked as they were still kinda limp and soft. There was no crunch when I bit into them. So the bacon was also pretty disappointing. The barbecue sauce was pretty good but it just couldn’t make up for the soft bacon and not-medium hamburger patty. Overall, I was disappointed with the Bronco burger since I had such fond memories of eating the other burgers from Wham before. Maybe next time I can request for the patty to be medium done or that the bacon be cooked more thoroughly. Will I go back? Probably. Nostalgia is something that’s hard to shake but I hope I can create some newer good memories rather than have to rely on sentimentality next time. Have you tried eating at Wham! burgers before? What can you say about your experience? Please leave your thoughts in the comments section below.